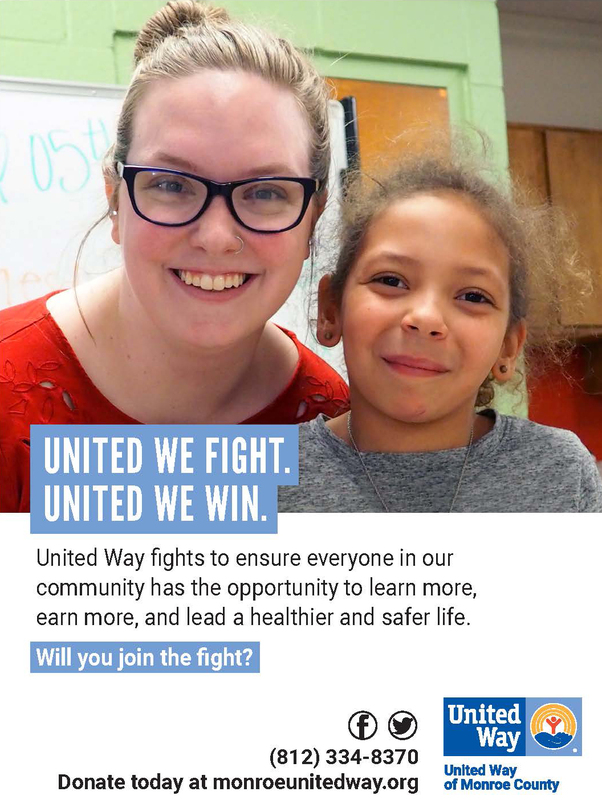 United Way fights for the education, earnings opportunity, and essential needs of everyone in our community. Your donation to United Way impacts 1 in 3 lives right here in Monroe, Owen, and Greene counties. Your annual United Way gift is at work 24/7 helping people by strengthening the building blocks of a better life – Education, Earnings & Essentials. everyone has access to the ESSENTIALS, like food, housing, health care, and help during a crisis. 4,435 youth participated in mentoring relationships or high-quality after-school programs designed to help them succeed through United Way. 612 of these youth received job-skills training. The Free Community Tax Service helped low-income people in Monroe and Owen counties bring back over $2.9 million in refunds and credits. 135 volunteers to help local residents file 2,824 federal returns at 8 full-service VITA sites managed by United Way, including a new full-service Spanish language site, plus 2 sites managed by AARP/TCE. Residents could also file using MyFreeTaxes.com.Clients report using those saved funds (as much as $1,290,568 in tax preparation fees) and increased Earned Income Tax Credits to pay for food, clothing, bills, rent, and to put toward savings. $1/wk equips 5 students with school supplies to thrive academically. $2/wk supplies 25 sack meals to hungry children throughout the year. $3/wk provides support for one person with a disability to receive on the job training for one month. $9/wk ensures 3 days of emergency shelter service for victims of domestic violence. $20/wk provides four families in need with vouchers to Opportunity House for clothing and household necessities. >> Member Agencies work with United Way to create success in our community thanks to your donations to the Community Action Fund. We are proud to award funding to these organizations through a local volunteer-led grants process. Click here for a full listing of member agencies. >> Collaborations bring key partners together to create a stronger community. Click here for a listing of current collaborations.